ANIMALS: Growing Up, Growing Dark And Growing Weird – Schlockmania! Teen coming-of-age films often follow a standardized template: establish a sensitive teen protagonist, give him or her a few problems, throw in a couple of laughs, throw in a tragedy for a dramatic turning point between the second and third acts and finish with some sort of “life is beautiful” or “things get better” message. Animals takes on this genre but thankfully it does not follow the aforementioned template. In fact, it uses both fantasy and a willingness to explore the dark side of teen growing pains to subvert that formula. 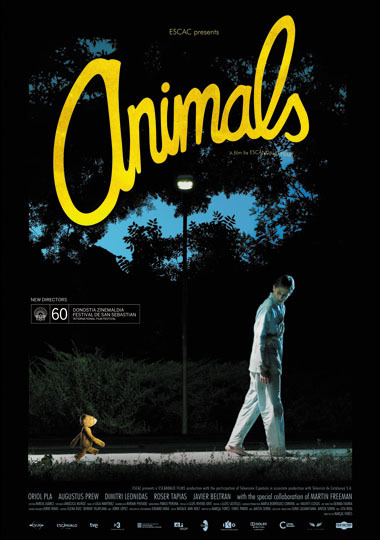 The teen protagonist of Animals is Pol (Orial Pla), a young man with problems to spare. First and foremost is his inability to let go of his longstanding friendship with Deerhoof, his childhood teddy bear. He spends most of his free time palling around with the bear at the expense of his friendships with other teens or the chance at a romantic relationship with Laia (Roser Tapias), a female friend who is willing and available. After his older brother Llorenc (Javier Beltran) puts a little pressure on him, Pol decides to move on to embracing adulthood. However, this doesn’t mean Pol’s troubles are over. He’s also confused about his sexuality, a problem that is compounded when he finds himself attracted to Ikari (Augustus Prew), a loner who has just joined his school. Ikari has a dark side and carelessly toys with the impressionable Pol. As the pressures and pains of growing up kick in, he finds himself wanting to retreat to simpler days with Deerhoof. He will come to a moment where he has to make a choice where his life is going and the result is as haunting as it is ambiguous. Animals draws its creative fire from being elusive. Co-writer/director Marcal Fores never goes easy on his audience, willfully blurring the line between reality and fantasy throughout the film and offsetting black humor with moments of unnerving drama. The result will be too strange and defiantly obtuse for some – but those are also the qualities that will endear it to other viewers. Fores handles his demanding blend of moods with confidence, creating a genuinely unpredictable story that keeps the viewer questioning their perceptions of what is happening up to the last few minutes. Those who can stick with the demanding approach of Animals will discover that it is one of those rare films that is extremely stylish without calling attention to its own technical polish. Fores uses stylization as an extension of his storytelling approach, deploying a glossy visual style and a clever, subtle blend of practical and visual effects to aid in blurring the line between Pol’s daydreams and the reality intruding on them. Eduard Grau’s cinematography has the kind of pastel loveliness you might associate with a Wes Anderson film but Fores twists it towards David Lynch-esque ends – and the score, which blends indie-rock with instrumentals in the same vein, adds another layer of irony to comment on the story. Finally, Fores gets strong performances from a cast that bring depth and dimension to characterizations that could have gotten lost in the surrealism. Pla’s work in the lead fits the film’s enigmatic style nicely, veering between a blank passiveness and moments of intense emotion. Prew is as charismatic as he is enigmatic as the story’s force of change and Tapia makes a sympathetic, likeably quirky female foil for Pol. Elsewhere, there is also a memorable turn from Dimitri Leonidas as a mischievous, sharp-tongued friend of Pol’s and fans of Edgar Wright’s work will be amused to see Martin Freeman to turn up as a concerned yet domineering teacher. In short, Animals requires that the viewer do some work – not only to follow the story’s elliptical twists but also to make up their own mind on the issues of maturity and sexuality that the story raises. That said, the skill and style that Fores employs in telling his story make Animals a challenge worth accepting and a refreshing alternative to usual predictable approach of other teen coming-of-age films.